subroutineTrace – If successful, the Runner reveals his or her grip. Trash each of those cards with a play or install cost equal to or less than the amount by which your trace strength exceeded his or her link strength. When resolving the trace on Waiver, by how much does the Corp’s trace strength need to exceed the Runner’s link strength in order to trash cards with cost X, such as Angel Arena and Bribery? 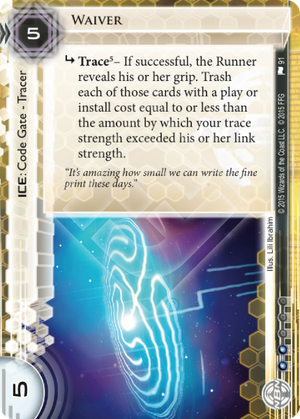 The Corp’s trace strength only needs to exceed the Runner’s link strength by 1 to be considered successful and trash cards with cost X. A printed cost of X is considered to be 0 when referenced outside of paying that cost to play/install the card. Poor Waiver. NBN's very own hand-wiping ICE alongside Komainu and Brainstorm, this little piece of bureaucracy has made shockingly little impact to the NBN ICE suite. This is a shame because it has a lot of things going for it. At a reasonable cost, too! 5 rez is one less than Fairchild 3.0, but you lose 2 subroutines and the bioroid weakness. Possibly following up with Salem's Hospitality or a freshly rezzed Ibrahim Salem. A Neural EMP kill is also possible. Runner has control over what you trash, may spend only up to their most expensive card, this is mitigated by the fact that you can see their hand still.